I want to live on this happy street!! 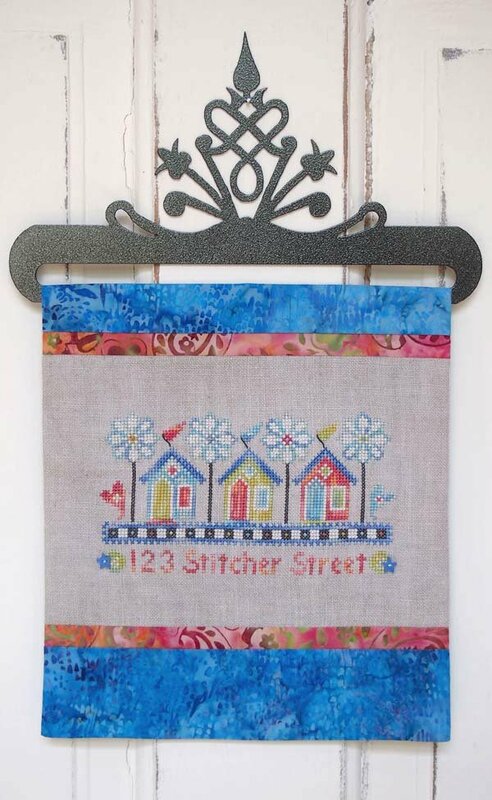 123 Stitcher Street is stitched over two on Weeks Dye Works 32 count Aspen linen using our collection of Sulky 12 weight Cotton Blendables and Solid Petites. This heavy weight cotton thread is used just as it comes off the spool, so you only need one strand. I love the combination of colors and plan to design more pieces using this set, as each spool contains 50 yards - and that's a lot of stitching! The cute 6-pack of Sulky thread is HERE. SamSarah polymer clay buttons are included with the chart and are not available separately. Finishing instructions included to hang the banner on an Ackfeld 8" Victorian split bottom hanger HERE.